Benefits: This seaweed was the original source of iodine, discovered in 1812. 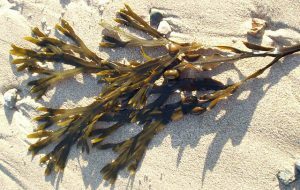 The weight-reducing reputation of bladderwrack is probably due to its effect on an underactive thyroid. It has proved most useful in the treatment of under active thyroid glands and goiter. Through regulation of the thyroid function, there is an improvement in all associated symptoms. An undetermined extract of Fucus has been shown to stimulate the thyroid beyond the effect of iodine. It has been extensively used in obesity due to both the bulking qualities and increased thyroid activity. Where obesity is associated with thyroid trouble, this herb may be helpful in reducing the excess weight. It is also used in providing relief for rheumatism and rheumatoid arthritis, used internally and externally as compresses and plasters which reduce the inflammation and pain of arthritis. The main herbal uses of bladderwrack are to remineralise the body. Active Constituents: Mucilage, mannitor, volatilie oil, potassium, iodine and many other minerals, algnates (salts of alginic acid) and sodium salts. The polysaccharides, being colloidal in nature, are used as bulking agent. Pharmacological Actions: Alterative, fluid regulator, metabolic stimulant, nutritive, thyroid tonic, anti-rheumatic, anti-inflammatory. Contraindications: Bladderwrack should be avoided in cases of hyperthyroidism or sensitivity to iodine. Avoid using during pregnancy or lactation.